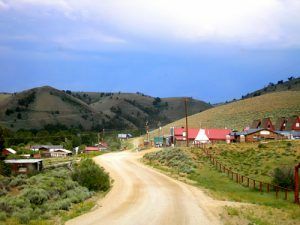 Situated some 27 miles south of Lander, Wyoming lies the once prosperous gold mining camp of Atlantic City. One of several gold camps that were outgrowths of nearby South Pass City, prospectors discovered gold near Rock Creek in the summer of 1868. The mineral-rich quartz vein, they called the Atlantic Ledge due to its location on the east side of the Continental Divide, was several feet thick and thousands of feet long. Word quickly spread and within no time, the area was flooded with miners. To accommodate these many prospectors, three men by the names of Collins, Thompson, and Tozier soon platted the town, sold lots, and Atlantic City was born. Though its location was isolated, being some 100 miles from the nearest railhead, winters were harsh, and Indian attacks were frequent, it didn’t keep the men from flocking to the new gold find. The camp boomed to a population of some 2000 people and boasted a church, a general store with a dance hall on its second story, a brewery, an opera house, a school, a drug store, and several saloons. Atlantic City’s first boom lasted about a decade before the gold ore began to play out. However, in 1884, in came a French engineer named Emil Granier, with investment capital to begin a hydraulic mining project. Hiring some 300 men, he began to build a 25 sluiceway to provide water to his claims east of Atlantic City down from Christina Lake, high in the Wind River Range. The ditch, that passed through miles of hard rock before snaking its way to Atlantic City, was finally completed in 1888. But, Granier’s dream would be foiled when it was found that the ditch had been built with too much slope and when the water rushed through it, many of the sluices were destroyed, spilling water and gold along the way. Small miners then rushed in and used the water for panning in the numerous gullies, many of whom were successful. By 1893, Granier’s company was bankrupt, and the defeated man returned to France to explain the project’s failure and request additional financing. Instead, he was jailed, tried, and sentenced to life in prison, where he died a few years later. Though its boom days were over, Atlantic City survived and new businesses were created over the next several years including the Giessler Store in 1893, which continues to stand today. Constructed by Lawrence Giessler with adobe brick and covered with metal siding, the building first served as the Giessler Store. In addition to running the store, Giessler also operated a freighting business and a ranch on Willow Creek. After his death, his wife, Emma, operated a cafe and boarding house in the building. The building finally closed in the late 1930s and sat abandoned for the next three decades. 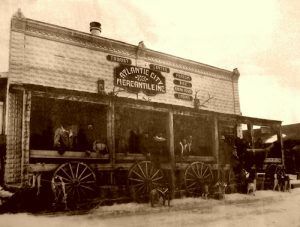 Today, the building, which is listed on the National Register of Historic Places, operates as a saloon and steakhouse, called the Atlantic City Mercantile. In 1890, the Clarence and Nellie Carpenter arrived in Atlantic City and the following year Nellie began serving meals to miners in her home. 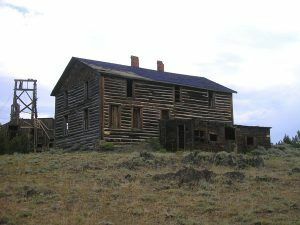 When the Dexter Mine created a small boom after the turn of the century, the Carpenters built an addition to their home and began to take in boarders. It soon became the Carpenter Hotel, which was expanded in the 1930s and was run by their daughter, Ellen until her death in 1961. Today, the buildings still operate as a bed and breakfast called the Miner’s Delight Inn. 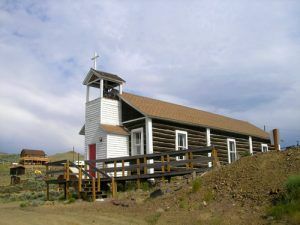 In 1912, the historic St. Andrews Episcopal Church was built, which continues to provide services to parishioners today. It, too, is listed on the National Register of Historic Places. By 1920, the last of the area mines closed; however, in 1933, the E.T. Fisher Company built a mining dredge that operated on the streams near Atlantic City, which provided the town with another small boom of prosperity. Though the operation lasted only a few years, the dredge recovered over $700,000 in gold along some ten miles of Rock Creek. During the depression years, the town also welcomed a number of new miners who began to work claims again and a few of the mines re-opened. However, this spurt was also short-lived. By the 1950s, Atlantic City had become a ghost town, with only a half dozen residents and the only open business was the Carpenter Hotel. The next decade, the mining camp saw its last frenzied mining activity when the United States Steel Corporation constructed a large, open pit iron ore mine three miles northwest of Atlantic City. 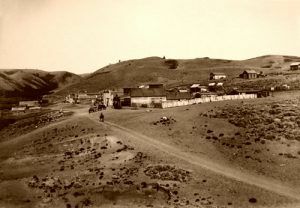 Although most of the miners commuted from Lander, several made their homes in the old boom camp. The Iron Mine closed in 1982, and Atlantic City soon became the sleepy little town it is today, occupied by summer vacationers and about 50 full-time residents. Several historic buildings remain in this old mining camp, some of which have been restored and used as homes, while others are fading under Mother Nature’s relentless forces. A walking tour brochure is available at an interpretive sign on Atlantic City Road. To get to Atlantic City, travel south of Lander, Wyoming on Highway 28 about 27 miles, then turn southwest on Atlantic City Road for about three miles. To the east of Atlantic City, on Fort Stambaugh Road, is the tumbling old mining camp of Miners Delight, which was also called Hamilton City. Located on BLM land, the site can be accessed on about a ¼ mile walking trail. Just some four miles west is the old townsite of South Pass City, which today is preserved as a Wyoming State Park. Along the way, sitting atop a hill on the south side of the road is an old mine and mill. It can be accessed by a road just west of the site. Update October, 2009: From our readers, Barbara and Bob Townsend, who own the Miner’s Delight Inn Bed & Breakfast in Atlantic City, we not only received several clarifications for our article, but, also learn that the Duncan Mill’s exterior covering was removed, a new roof was installed, and all new exterior coverings were installed. Per the Townsends, the work crews did such a great job that the work looks original.